One of the Sonoran Desert’s less conspicuous spring wildflowers is the desert chia, Salvia columbariae, a small, slender plant with dull green foliage. The plant commonly grows to 12” high with a similar width, but under extremely dry conditions, it may grow to only a few inches. While not a showstopper, desert chia is striking for its whorls of white-tipped blue flowers nestled in a cluster of wine-red bracts and sepals. Strongly aromatic leaves grow at the base of the plant and have deeply set veins that produce a very bumpy, irregular surface. From these basal leaves grows a square stem with 1 to 4 whorls of flowers. Inside desert chia’s tiny blue flowers is a unique pollination mechanism characteristic of the genus Salvia. Each stamen has both a fertile and infertile anther separated by a thin connective that balances on the end of the stamen’s filament. The fertile anther protrudes from the opening of the flower while the sterile anther extends toward the back of the flower. When an insect enters the flower, its head naturally pushes the lower half of the stamen (infertile) against the wall of the corolla, and the upper half (fertile) bends down to deposit pollen on the back of the insect. 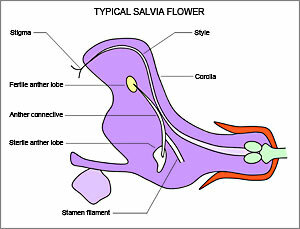 The diagram shown here is a longitudinal section of a generic salvia flower that shows the fertile anther at the top of the corolla and the infertile anther near the corolla’s lower lip (the insect’s landing pad) waiting for a pollinator to push them backwards and lower the fertile stamen. 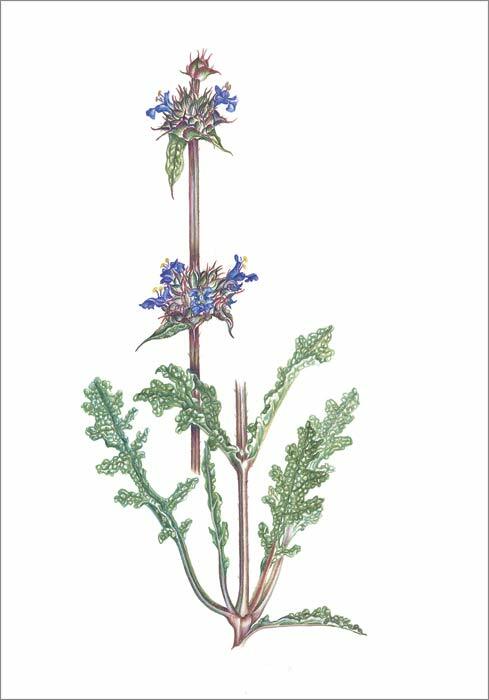 Margaret Pope’s portrait of Salvia columbariae illustrates the whorled inflorescence and also the texture of the basal leaves. The tiny blue flowers have two stamens with yellow anthers protruding from the flower—the upper portion of the stamen that will eventually dust the backs of visiting pollinators. 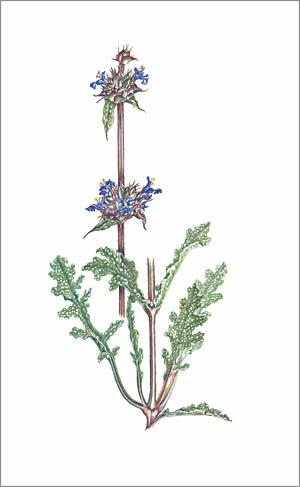 Margaret’s drawing is now part of the Sonoran Desert Florilegium, as are all the wildflower illustrations that she prepared for the Arizona Native Plant Society’s “Sonoran Desert Wildflowers” poster. This appeared in the March 2017 issue of The Desert Breeze, the monthly newsletter of the Tucson Cactus and Succulent Society.